This is a cream that comes in a very small bottle and seems to work a little differently from the standard creams and ointments out there. What is so exciting about this one is that it is supposed to be applied to prevent from flares occurring in the future, but the only problem I found with this one was that it does not work so well with flares that have already occurred. It does lessen the pain, but it doesn’t always get rid of it instantly, so it doesn’t act as fast as other creams I have used. Can be used on children over 2 years old and adults. It should be applied 3 to 4 times daily but not more than that. 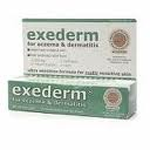 It helps with itchy, scratchy, redness associated with eczema and other dermatological nuisances. Contains 1% hydrocortisone acetate which helps in fighting itch. My main problem with this cream is that I used it on affected areas, but rather than lessening the pain instantly like some other creams that I have used, it didn’t do much at all. However, once I started using it on spots that were a little pink before they flared up, they went away without any worry. That was a really nice bonus, but I can’t carry this cream around with me all day wherever I go and constantly inspect my body for signs of flares. Sometimes I just need a fast cure and this isn’t it.